A Scary Environment: Will Inhofe Be Back In Charge? One of the most significant fallouts of Tuesday’s election, as I mentioned briefly in my last post, is that Oklahoma’s own U.S. Sen. Jim Inhofe is expected to become chair again of the Senate Environment and Public Works Committee. Republicans now have control of the Senate, and Inhofe is the ranking GOP member of the EPW Committee. In short, this is extremely bad news for the planet. Inhofe, who will soon turn 80, has led a crusade through the years trying and failing to dispute scientific evidence that manmade carbon emissions have contributed to global warming. This crusade, which includes constant blithering criticism of the Environmental Protect Agency, has been the centerpiece of his political career. It has made him infamous throughout the world. Those voters who supported Inhofe here, along with media outlets such as The Oklahoman, are directly responsible for what is or isn’t going to happen next when it comes to climate change. If this country declines to take action to help stop global warming and reduce carbon emissions, the planet’s future is bleak. It could be cataclysmic unless there’s an election correction in 2016. As you know, Inhofe has called the science explaining climate change and global warming a “hoax.” The title of his 2012 book, The Greatest Hoax: How the Global Warming Conspiracy Threatens Your Future, is a blunt, straightforward statement of his position. What Inhofe has done is help create the idea that there’s a raging “debate” about global warming when, in fact, there’s no debate. There’s only basic scientific evidence that the planet is getting warmer, the arctic ice cap is melting and sea levels are rising because of manmade carbon dioxide emissions. We might debate what we should do in light of this evidence, but the science is clear. Inhofe has received a lot of national press attention after Tuesday’s election because he’s likely to become chair of the EPW Committee, which he led from 2003 to 2008. Here’s an excellent piece in The Washington Post about him. What much of the recent coverage of Inhofe has failed to note, however, is how much campaign money he has received from the oil and gas industry through the years. Since 1989, Inhofe has received more than $1.7 million in campaign contributions from oil and gas interests, according to OpenSecrets.org. The media coverage usually notes in some form, of course, that Inhofe comes from a state rich in fossil fuels, but it doesn’t refer directly to the campaign money. Maybe this is because the direct relationship between a politician and the interests of his largest campaign contributors these days is so obvious that it doesn’t even need mentioning. I still think it does. 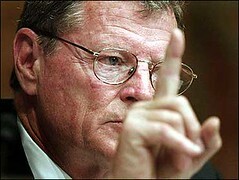 So let me state the obvious: Inhofe has always done the bidding of large oil and gas companies. As chair of the EPW Committee, he will have even more influence and power to serve their interests. It’s unclear what exactly Inhofe can do in the next two years because of the potential for White House vetoes, but he is sure to create a lot of noise and engage in political theatrical performances over issues such as global warming and curbing power-plant emissions. He’s also going to support and encourage hydraulic fracturing, or fracking, an oil and gas extraction method, which is extremely harmful to the environment and has led to a glut in oil and gas production.